Artemisia is a genus of hundreds of species of plants from the compositeae (AKA asteraceae) family. It derives its name from Artemis, the Greek Goddess of the hunt, the woodlands and the moon. In folk medicine, it is considered a feminine plant, with protective powers to guard over witch's gardens, and healing properties especially in relation to the uterus. Hence the connection to Artemis: among the many duties of the virgin Goddess was to assist women in childbirth, and also she is considered the bringer of women ailment and also the one who heals from them. Overwhelmingly bitter, artemisia is mentioned in the Bible seven times, as a symbol for extreme bitterness and suffering. Artemisia is used to flavour the notorious (and for the longest time, forbidden) Absinthe: due to suspicions about the thujone content being responsible for neurotoxicity and hallucinogenic effects, it was banned in many countries from around 1912-2007 (each country has its own strange relationship with this spirit, and all fingers pointed the blame on the flavouring plant, rather than the unusually high alcohol content, around 70%) . In those who do produce it, the level of artemisia is still often strictly controlled and regulated, despite the fact that scientific data shows that Artemisia absthinthum does not have a dangerous or toxic level of thujone. Like most members of the compositeae family, it has an intensity that is almost cloying (compare to other species, such as Artemisia dracunculus, AKA tarragon; Artemisia pallens, AKA Davana, immortelle/helicrysum, marigold/tagetes and chamomile) has an intense, cloying medicinal aroma that is overwhelming in large quantities. Several closely related species such as A. alba, A. vulgaris, A. absinthium, A. arborescens all have the characteristic bitter flavour and intense aroma, silvery fronds and similar uses. Mugwort or Armoise, which is really the French word for Artemisia - both usually refer to Artemisia vulgaris. Artemisias have a potent, herbaceous and bitter presence. In very minute quantities, it can have a surprising effect in perfumes, especially when paired with very sweet florals and sweet balsamic bases. Its use in perfume is mainly in Fougère compositions, where it works beautifully with the lavender, oakmoss and coumarin, adding another layer of bitter herbaceous quality. Wormwood (Artemisia arborescens) is one of the important monastery herbs, and is found wild in Israel near ancient Crusaders' forts, i.e. the Monforte (a Hospiteral fort by Kziv creek in Israel). Therefore it is believed that the crusaders brought it with them to plant in their own "monastery gardens" by these fortresses. Curiously, it is now one of the fragrant herbs planted in Muslim cemeteries, because it is believed that a good scent would be pleasing to the angels that judge the souls of the deceased. Artemisia herb-alba is native to the Negev in Israel, and the bedouins in the desert used it as a general antiseptic, vermifuge, and antispasmodic. Also, it was used to treat diabetics, because its intense bitterness was believed to balance the excess of sugar and stimulate the liver and pancreas (much like other bitter herbs, such as germander, sage, etc.). Mugwort (Artemisia vulgaris), AKA cronewort is a nerve tonic and a digestive tonic (stimulated bile production), increases menstrual bleeding, and to deal with pulmonary diseases and disturbances. Mugwort is regarded as a plant with protective powers, and was planted in witch's gardens to guard them - as well as to announce them as medicine women and midwives - either as a plant in the garden, or in a planted pot or even painting on the door of urban witches. Mugwort and lavender are used together in dream pillows to balance their opposing actions of alertness/relaxation. This particular plant has broader leaves that are green on top and have a silvery underside (not all silver like the wormwood or absinthe plants). This silveriness alludes to the connection to the moon, and also wisdom of the crone. Coastal mugwort (Artemisia suksdorfii) and Sagebrush (Artemisia tridentata) are used by First Nations in British Columbia (and the West Coast in general) to cleanse and purify the space in smudging ceremonies. It is interesting to note that cedar leaf, which has a very high thujone content, is used in the same manner. It was used as a prevent infections in wounds, for athlete's foot, as a headache remedy, and to stop internal bleeding. A. tridentata has most camphor, terpionoids and tannins, and its smoke was used to tan hides by the Okanagan's first nations people. Another type of mugwort, Coastal Sagebrush, AKA California Sagebrush (A. californica), is used in very similar ways to mugwort (A. vulgaris), to treat respiratory complaints (including coughs, colds and asthma), for pain relief (sprains, reumatism, muscle pain and more), to ease menstrual cramps, and assist during child birth. Its pain relief properties are powerful - applied as a liniment, it is much more effective and safer than opioid painkillers, and can even relief the intense pain from broken bones. Chinese medicine uses Moxibustion during acupuncture treatment, in which the practitioner would burn A. moxa as well as A. argyi on top of the needles which warms them up, and is supposed to activate the qi and strengthen the body. It is considered to help improve blood supply to the pelvic area, and also promote fertility. 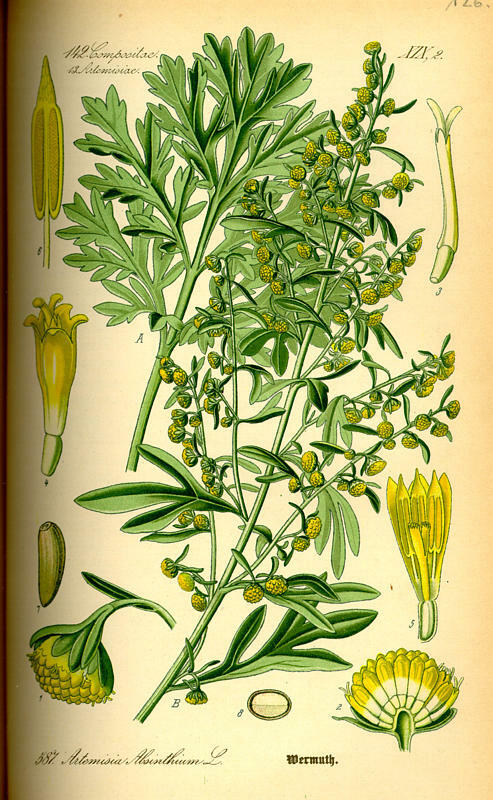 Chinese mugwort (A. argyi) is used by traditional Chinese medicine doctors mostly to treat women - to stop bleeding during mensuration, pregnagney or postpartum; but also to promote mensuration (many types of artemisias are used as emmenagogues). The essential oil is used to treat asthma, coughs and other respiratory issues via spraying at the back of the throat. The essential oil was proven to have antiseptic properties against several bacteria. A. apiaceae is another species that grows in China and when dried is used to treat vertigo, cold sweats and high fever. The flowers are used for treating headaches and for joint pain relief. In Japan, yomogi heating pads filled with Japanese mugwort are used to keep the crotch area warm and cozy (I'm still trying to figure out when would that be actually comfortable), and yomogi water bottles are used for warming the pelvis in general and ease pelvic pain. The two main species that have known in the West for their medicinal value are the A. herba-alba (native to North Africa, and also grows wild in the deserts of Israel) and A. arborescens (also grows wild in Israel). Their high santonin content makes them especially effective against intestinal worms. They are also used to treat other digestive complaints such as stomach ache and nauseae, as well as colds, coughs, etc. Artemisia arborescens (Sheeba in Arabic) is native to the Mediterranean region and is enjoyed with black tea, especially in the wintertime, throughout North Africa and in Israel. derives its synonym wormwood from its ability to chase away worms from the digestive system. A. absinthium is a European artemisia, used in folk medicine to strengthen the body, ease digestion, reduce fever and remove intestinal worms. A. annua contains artemisinin, is the current most effective drug to treat Plasmodium falciparum malaria. A. capillaris has sedative-hypnotic effects, some say as strong as that of cannabis. Newer discoveries regarding artemisia show that thujone affects GABA levels and uptake in the brain, and acts very much like THC in cannabis does. Artemisia has a strong medicinal flavour, and is mostly drank as a medicinal or warming and energizing winter tea in North Africa and among the Moroccan Jews in Israel. It is also drank as a beneficial tea with the name Yomogi and Ssuk in Japan and Korea respectively. Kusa mochi (literally means "grass mochi") is a seasonal Japanese pastry for spring, which is flavoured with mugwort (it is softened with baking soda to remove some of the bitterness). Yomogi mochi is a sweet rice pastry flavoured with mugwort and filled with sweet red bean paste. Another type of Japanese pastry featuring mugwort is Hanami Dango, a trio of white, pink and green balls of mochiko served on a sewer, which symbolize the cherry blossom in its green leaf, bud and flower state. Artemisia absthuinthium was used to spice mead in Medieval times. In 18th Centruy England, it was used to make beer much like hops (whose bitterness - or more accurately, the chemicals that are responsible for it - is effective in preventing spoilage of the barley during the fermentation process. 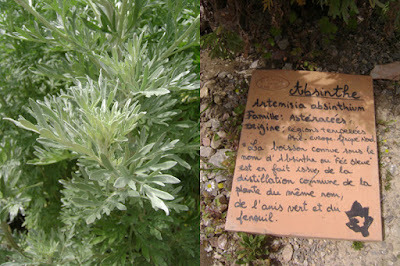 Artemisia is used to flavour various spirits and wines, chief among them being bitters, in which it takes the role of a battering agent; in the bitter liquor pelinkovac (from former Yugoslavia); and is a key ingredient in two important and equally famous alcoholic beverages, which both were used originally for medicinal purposes: absinthe and vermouth. Artemisia absinthium in combination with fennel and aniseed, is used to flavour the green-coloured Absinthe spirit, giving it a distinctive anise flavour. Other elements, such as melissa (lemon balm), angelica, peppermint, coriander, veronica or star anise may also be used. Absinthe is traditionally served diluted with water, which is poured over a sugar cube through an ornate spoon. Once diluted, it takes on a milky appearance (due to the high content of essential oils within the alcohol). Sazerac, New Orleans' famous whiskey cocktail, is delicately flavoured with absinthe, by swishing or spraying the glass with the spirit before serving. I wonder if we'd need to wait a 100 years for the draconian restrictions on oak moss to lift. Turns out that the dangerous reputation regarding absinthe (hallucinations, violence and seizures) is mostly a myth - and that although thujone can be a neurotoxin in high quantities, none of the absinthe of the past nor present presents such a threat, and the negative effects of "absinthism" are in fact to blame on alcoholism: absinthe was traditionally a very high in alcohol content (68-72%); and unfortunately, not infrequently it as made with poor alcohol contains the toxic methanol, and at times even with a toxic green dye. Vermouth began as a German wormwood wine Wermut is German for wormwood, and the word got bastardized as it travelled form Germany to Italy and from there to the rest of Europe and eventually the UK. Aside from wormwood, vermouths may be flavoured with herbs such as marjoram and hyssop, spices such as cloves, cinnamon, cardamom, coriander and ginger; as well as with citrus peel, chamomile, and with juniper and quinine. Artemisia herba-alba essential oil is green in colour, and I have not had the honour to smell it in person. Artemisia vulgaris essential oil is a clear yellow mobile liquid, and has an herbaceous, bitter, intense, offensive and aggressive even scent, reminiscent of cedar-leaf and sage. It is also lightly berry-like and musky with woody undertones. Hints of marigold and chamomile undertones as well. Waxy like candle and becomes more sweet and honeyed, floral after a while. Hints of peach stone. Artemisia's green, fresh, herbaceous qualities make it the perfect conspirator in Fougère and Chypre compositions, as well as foresty fragrances. Last but not least - tobacco and leather fragrances, to which it contributes an almost palpable bitterness that creates an illusion of chewing tobacco. It also finds its way into soap fragrances and is also a popular scent for Japanese bath salts and an addition to hot springs "spa". The key to using it is creativity and imagination: Do not use it as a main theme but in combination with other notes, where it will act as an accessory note to create a surprising effect. I have tinctured fresh leaves of Artemisia arborescens and the result is a very clean, fresh and green aroma which I am now curious to work with both as a flavouring agent (in bitters) and in fragrance compositions.